Primarily undeveloped, Austin Township within Mecosta County is a township made up of about 1,500 in population. Austin Township is located approximately five (5) miles southeast of the City of Big Rapids in the southwestern quarter of the County, and two (2) miles east of US 131. Substantially wooded, the township is home to portions of the Chippewa River State Forest, several Amish districts and many farms, natural gas storage fields, and adjacent to Canadian Lakes development. You can find many farm markets and a produce auction center within our Township. Come enjoy the quietness of a quaint area. FIRE SERVICE FOR AUSTIN TOWNSHIP IS NOW PROVIDED BY MORTON TOWNSHIP FIRE DEPARTMENT AS OF SEPTEMBER 1, 2018. 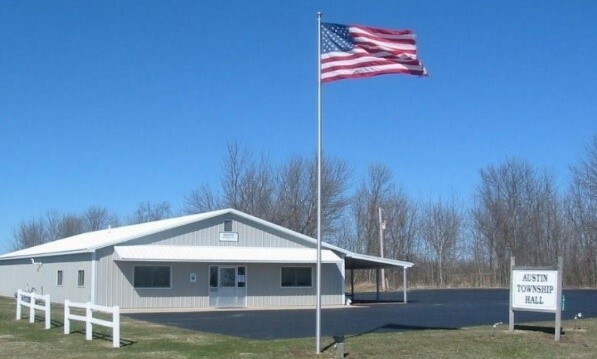 May 7, 2019 Tuesday, Treasurer Office Hours 10:30 - 1:00 p.m.
May 14, 2019 Township Board Meeting 7:30 p.m.
We accept credit/debit payments for property taxes only. Available during office hours or by appointment. There is a 3% fee added.